Use a line and bar chart to easily distinguish between line value and bar values. This is a quick way to visually compare data sets that have different value ranges, like project cost in the millions and project hours in the thousands, or number of sales in the tens and profitability in the thousands. This line and bar chart provides a quick view of profitability across an organization. Like all Quick Base charts, line and bar charts are interactive; click an area of the chart to view the record(s) associated with it. You can also apply dynamic filters to line and bar charts. 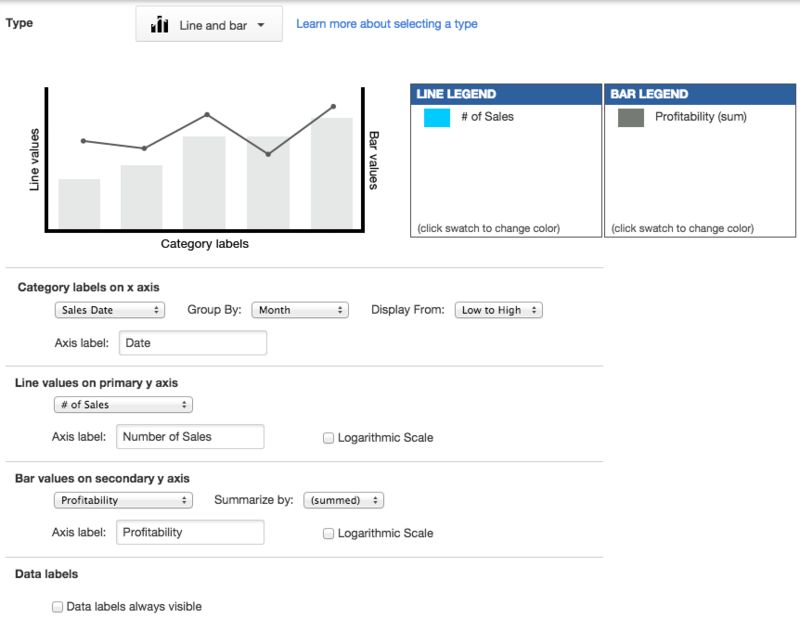 Select Line and bar as the chart Type. Category labels on x axis: select the field you want to display on the x axis. In the Group by list, select to group values in intervals or set amounts, for example, by Month. Line values on primary y axis: select the field you want to display as a line on the primary y axis. If you want to define a calculated column to display in the chart, select Calculated column, and then define the calculated formula in the Options section. Bar values on secondary y axis: select the field you want to display as a bar on the secondary y axis. If you want to define a calculated column to display in the chart, select Calculated column, and then define the calculated formula in the Options section. Tip: Remember to label the axes; this helps others understand your chart. Sorting: decide how to sort your line and bar chart. Filter to display only certain types of data or data that meets conditions you set. 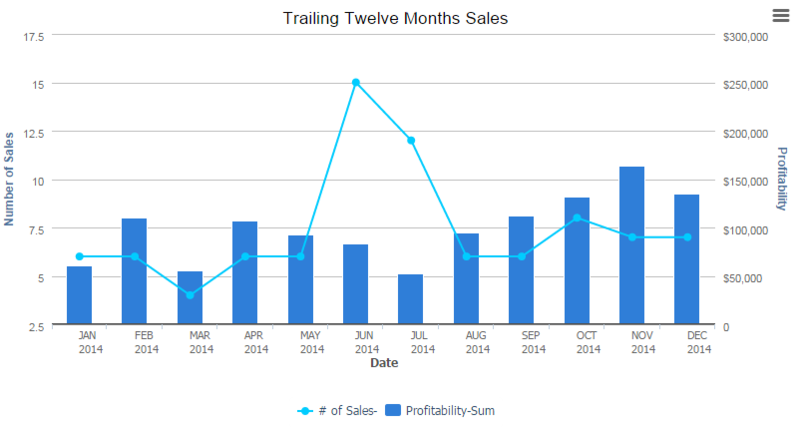 This line and bar chart provides a quick view of profitability across an organization. You can see quickly see where profitability has dipped, so you can dig in and address the problem.